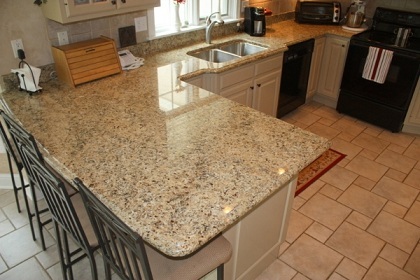 The Granite Gurus: FAQ Friday: What Color of Blanco Sink Goes With Ouro Brazil Granite? FAQ Friday: What Color of Blanco Sink Goes With Ouro Brazil Granite? After last week's FAQ Friday I received quite a few emails asking for advice on sink colors. I've answered most of the emails personally, but thought I'd feature one here for FAQ Friday. "My wife and I are remodeling our kitchen and are having some trouble deciding on what color Blanco silgranite undermount sink to use. We already picked our granite counter top (Ouro Brazil) and are torn between Biscotti and Café Brown. We have maple cabinets with a natural finish. We chose a delta faucet with a Venetian bronze finish. The backsplash is Mojave tumbled travertine (3”x3”). I’m inclined to go with the darker color as a contrast. My wife seems to be leaning to the lighter color. Any thoughts? We’ve been going around in circles so much I’m dizzy!" Thanks for the email Charlie. Your kitchen sounds like it will be beautiful! First, good choice on the Blanco Silgranit sink. They are definitely my recommendation. Honestly, you can't go wrong with the light or the dark sink. Both colors are beautiful and will look great with the Ouro Brazil granite. Like you said, the darker will provide a beautiful contrast if that's what you are going for. I'll give you my personal opinion though. As long as the tones of the Ouro Brazil granite match the tones of the Biscotti sink I'd go with the Biscotti. Everything else in your kitchen is light enough that I personally wouldn't want the sink the be the one dark thing. Ouro Brazil granite. Photo source. If you have a stone or design question you'd like to see answered here send me an email. The Granite Gurus is the blog for our company, MGS by Design. We are a custom stone fabricator in Utah. We try to focus on the design aspect of stone here on this blog and in our work every day. Our goal on this blog is to provide you with a little more information about the stone world, design inspiration, our opinions, our experience, beautiful photos and maybe a few fun facts along the way. Also, be sure to check out our company website. MGS by Design. “The longer I live the more beautiful life becomes.